Having spent many years of his early career in TV and film, Chris is now better known for his fishing – as a fly fisher, a vintage tackle collector and a fly tyer. Many of his innovative patterns have been featured in Fly Fishing and Fly Tying magazine and on Sky Sports TV show Tight Lines. 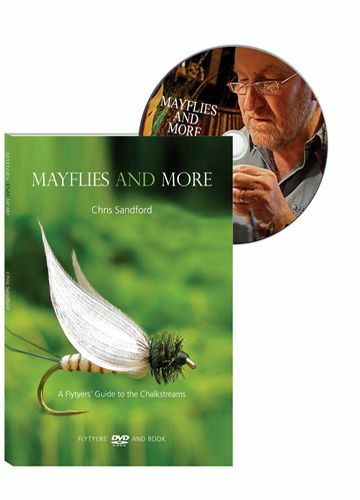 In this DVD and booklet Chris has combined his knowledge of fly tying with his film production and presenting expertise to demonstrate the tying of flies that he has developed for fishing the rivers and still waters of southern England. The 70-minute DVD contains 10 films that demonstrate the tying of 10 flies. The accompanying 32-page, full colour booklet gives step by step details for tying the same flies, illustrated with extraordinarily detailed photographs. To see a sample of Mayflies & More – and find out what Geoffrey Palmer thinks of fly tying, watch the video below. Previous Previous post: Get Your Old Tackle Out!